Winnipeg Jet goaltender Connor Hellebuyck has his ups and downs, but with 54 games under his belt Connor Hellebuyck has stopped 91.3 percent of shots, or 92.9 when looking exclusively for 5v5 situations. Despite some recent struggles and public outcry, Hellebuyck has been better than what Winnipeg has experienced yet. Connor Hellebuyck has played for 54 games. 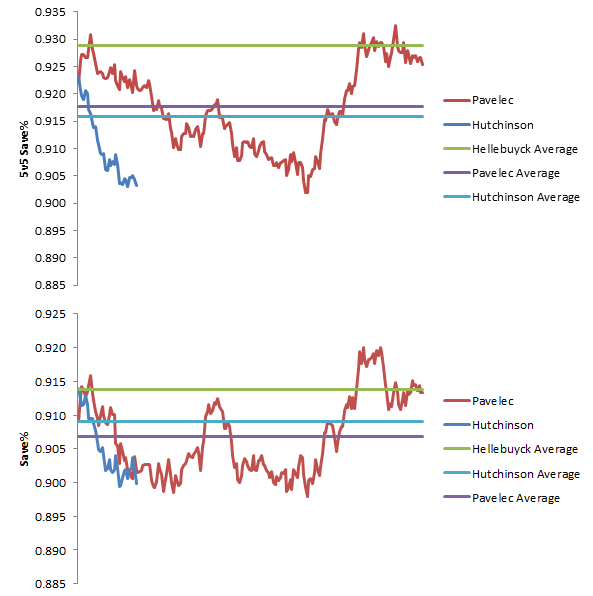 The above graphs show the 54 game rolling average for Ondrej Pavelec and Michael Hutchinson. 1) Aside from Pavele’s hot-streak that sent the Jets into the 2014-15 playoffs, the Jets have rarely ever had a goalie play as well as Hellebuyck has on average. 2) 94% of Pavelec’s 54 game streaks for 5v5 save percentage has been worse than than Hellebuyck, while 100% of Hutchinson’s streaks were worse. 3) 84% of Pavelec’s 54 game streaks for all-minutes save percentage has been worse than Hellebuyck, while 99% of Hutchinson’s were worse. 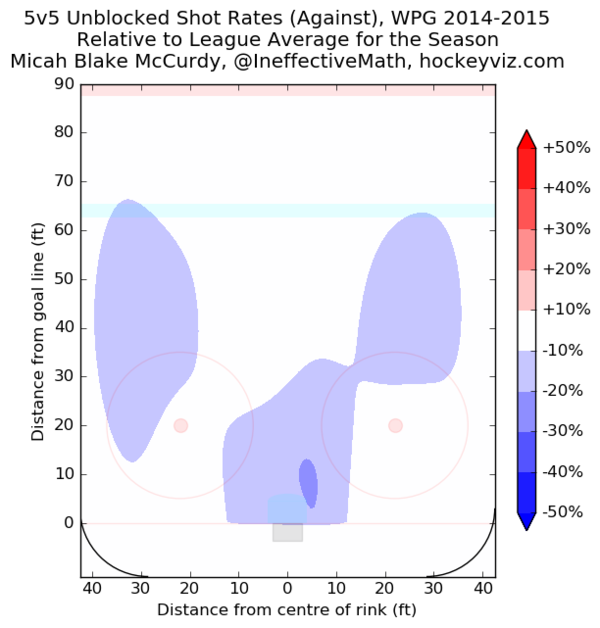 4) We can see the high variance that is save percentage. Ondrej Pavelec has ranged from a 0.900 to a 0.920 goalie over a 54 game sample. That’s replacement level to a fringe All-Star. This is why goalies need a long while to figure out who they truly are. The industry standard is typically 2000-3000 shots minimum. 5) When we look at Pavelec’s first and last 3000 shots, that has no overlap, we see his save percentage samples falling within +/- 0.002 of his career average. 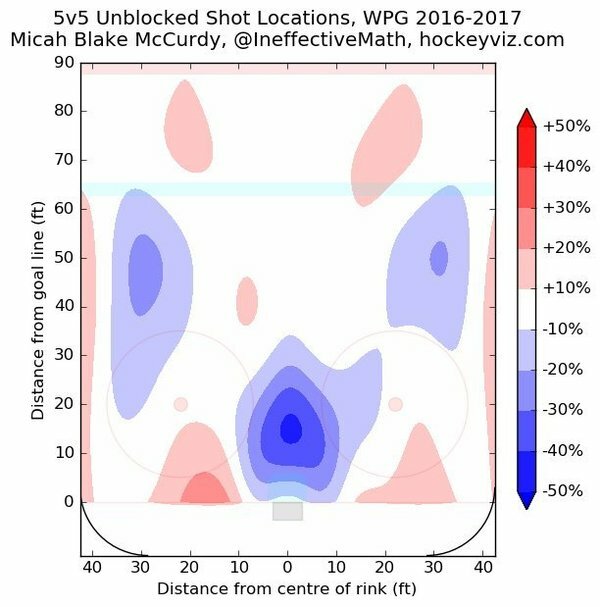 6) There still is some time to truly tell who he is, but at just over 2000 shots he looks to be essentially equal to Pavelec. 5v5 save percentage suggests slightly worse while all-minute save percentage suggests somewhat similar. There is still time for some adjustment, up or down, but at least Hutchinson carries a very team friendly contract. The Jets current goaltender situations is really interesting. They have one goalie that has been better than really they have ever experienced. Connor Hellebuyck has been the 9th best goaltender for 5v5 situations to play over 2000 minutes over the past 4 seasons combined (sample is 68). Over the same sample, Hellebuyck has been the 38th best goalie for all-situations to play over 50 games (sample is 66). Basically he’s been an average NHL goaltender for all minutes or a top goaltender for 5v5, and both are similarly predictive in how good a goalie will be in the future. Another way to look at things, Corsica’s expected goal model all suggests Hellebuyck’s and Pavelec’s expected 5v5 Fenwick (unblocked shots) save percentage should all be within 0.0033 of each other given the quality of shots they have faced. However, we see that the gap between Hellebuyck and Pavelec is two times that range. It’s interesting to see some people twist their narratives. There were many that defended the Jets save percentage problem was due to the team and not on the shoulders of Pavelec, despite what evidence suggested otherwise. They are struggling to describe why things are a certain way with using save percentage while trying to also discredit save percentage. Hellebuyck has been disappointing in someways. He only carries a 0.909 save percentage right now for this season, which is not what the Jets would like. Hellebuyck has not reached his potential, but he still might. His performance in 5v5 save percentage is extremely promising and suggests that Jets fans should not be too quick to give up hope yet. One element of the Jets game that has got to play hell with the goalies is the number of penalties the Jets take and how poor their penalty kill is. As it stands the Jets are spotting the opposition almost a goal a game from PPG’s. I am not sure if it’s my eyes deceiving me but it also seems the the Jets give opposing offence’s a lot more time and space to operate than they get in return. The Jets seem to hold back on closing the gap defensively and it often seems to lead to the opposition getting clean scoring opportunities with the Jets goalie forced out of position trying to react to a shot off of a clean pass. I find it especially evident on the penalty kill where the opposition will work the cycle, get the Jets penalty killers scrambling and then find clean seams to shoot from often leaving the Jets goalie with little chance of a save. Maurice’s teams seem to have a history of goal tending problems and I can’t help but wonder if it is not his “systems” that kills goalies. There are a lot of nights I watch the Jets and can’t help but feel that no goalie on the planet could survive the handicaps our goal tenders are expected to carry on a consistent basis. Any insights you could offer would be appreciated.